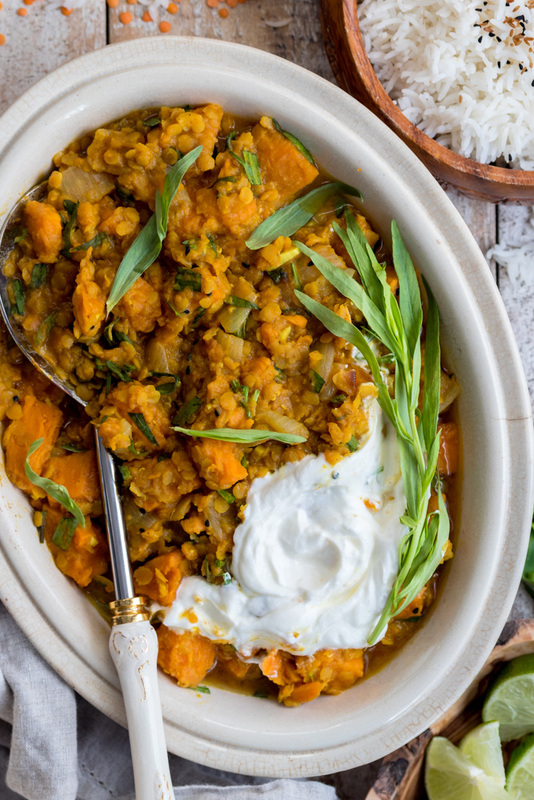 Serving up the best Red Lentil Sweet Potato Curry with Tarragon this weekend! 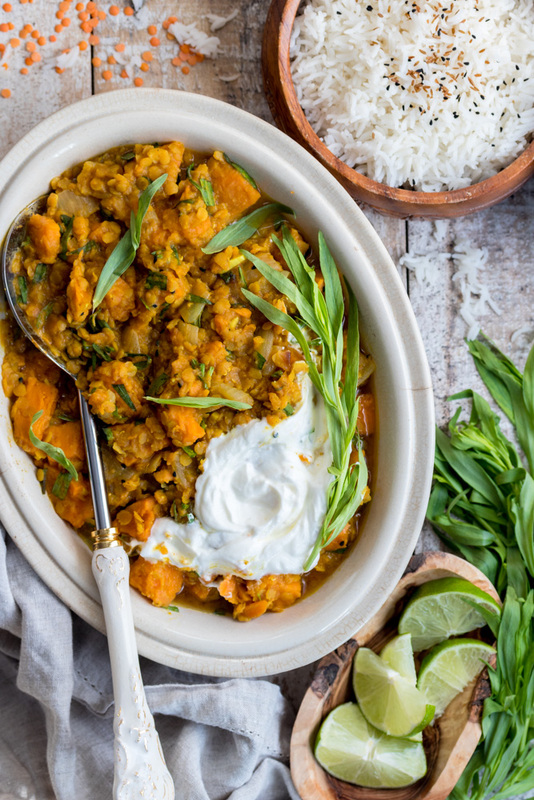 I know what you’re thinking…not another red lentil curry recipe. But this delightful vegetarian main is not like the others. For one, we didn’t use red curry paste or coconut milk, we instead used a few classic Indian dried spices and vegetable broth. Second, ours gets tossed with fresh tarragon instead of cilantro. This lends a sweet and light licorice taste that pairs wonderfully with the spices. And third, we roast the vegetables for tons of flavour. All this adds up to a quick (45 minutes!) and healthy plant based meal! 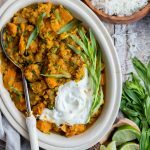 When we were doing a bit of research into making a red lentil curry, we noticed many recipes used red curry paste and coconut milk. Nothing wrong with that, we just didn’t want to put another recipe on the internet that was already done. So we decided on using a medium yellow curry powder, cumin and nigella seeds and left the coconut milk out entirely. Now if you’re like us, you may be new to nigella seeds, but don’t let that deter you from giving this a shot. We ordered ours online, through Jacobson’s (not sponsored, just sharing). The seeds have a somewhat toasted onion flavour, but with a herbaceous element, similar to oregano. A delightful flavour in curry – trust us. Finally, the use of tarragon here may seem unusual. Our previous knowledge of tarragon was that it was common in French cooking, and that it had a licorice flavour. Which isn’t wrong, but definitely limited our understanding of how it could be used. I recently made a curried egg and cauliflower dish from Ottlenghi’s cookbook Simple, and it used fresh tarragon. I loved the flavour and couldn’t wait to use it again, and that’s coming from someone who hates black licorice (the red kind is okay). We hope you give this hearty vegetarian dish a try, and please let us know what you think! You can find us on Instagram and facebook, and if you don’t want to miss our weekly new recipes, sign up for our email newsletter – just scroll to the top and enter your email on the left hand side of the page! A sweet and savoury vegetarian curry with a fresh light licorice flavour from the tarragon. Preheat oven to 425F. Line a baking sheet with parchment paper, add the sweet potato and onion wedges, drizzle with 3 tbsp oil, then bake for 25 minutes, stirring halfway though. Remove from oven when onion and potato is soft and beginning to char. Meanwhile, add the remaining tbsp oil to a large skillet and heat over medium. Add the garlic, cumin, curry powder, and ginger and fry for 30 seconds. Add the lentils, broth, water, salt and nigella seeds and bring to a simmer. Cover and cook for 15 minutes. Remove the lid, stir in the onion and sweet potato and cook uncovered until stew is thickened, about 5 minutes. Remove from heat, stir in the tarragon and the juice from one lime. Serve with rice, yogurt and more lime wedges.